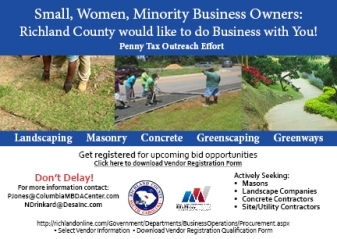 SMALL, WOMEN AND MINORITY-OWNED BUSINESSES SOUGHT TO PROVIDE SERVICES TO COUNTY | DESA, Inc.
Columbia, SC – Today, the South Carolina Minority Business Development Agency (MBDA) Business Center launches a county-wide effort to encourage small, women and minority business enterprises (SWMBE) to register for impending Richland County Transportation Penny opportunities. As the County gears up, the MBDA Business Center has a memorandum of understanding with Richland County to encourage businesses to register in advance. The “Penny Tax” became effective on May 1, 2013 and is expected to generate more than $1.1 billion dollars in revenues over the next 22 years. As more than $730 million have been earmarked for roadway, sidewalk, bike, pedestrian and greenway projects, professional and trade service providers are encouraged to register. Opportunities will be available for architects, general/prime contractors, masons, landscape companies, concrete contractors and site/utility contractors, engineers and others. MBDA director, Cheryl Salley, rallies for the increased participation of small, women and minority-owned businesses within the County procurement practices. “According to an economic impact study provided by Miley & Associates, the Penny Tax is expected to create more than 4,100 jobs and generate $162 million of direct labor income. Getting qualified with the County is the first step small, women and minority-owned businesses can take to have a chance to vie for their share of the business,” Salley says. To begin the qualification process, business owners can download and complete the Richland County Office of Procurement & Contracting Standard Qualification Form. The completed form and required documents should be submitted by email to: rcsolicitations@rcgov.us. For additional information or assistance completing the qualification form, business owners can contact Pam Jones at PJones@ColumbiaMBDACenter.com or call 803-743-1154.